Dr. Bruce Rogers-Vaughn speaks at Mental Health Counseling Conference at Belmont University campus in Nashville, Tennessee, September 21, 2018. The conversation was led by Dr. Bruce Rogers-Vaughn, an associate professor of the practice of pastoral theology and counseling at Vanderbilt Divinity School who brings 30 years of experience in clinical pastoral psychotherapy to his teaching and research. Dr. Rogers-Vaughn is also president/co-founder of the Pastoral Center for Healing in Nashville, where he continues his clinical practice. 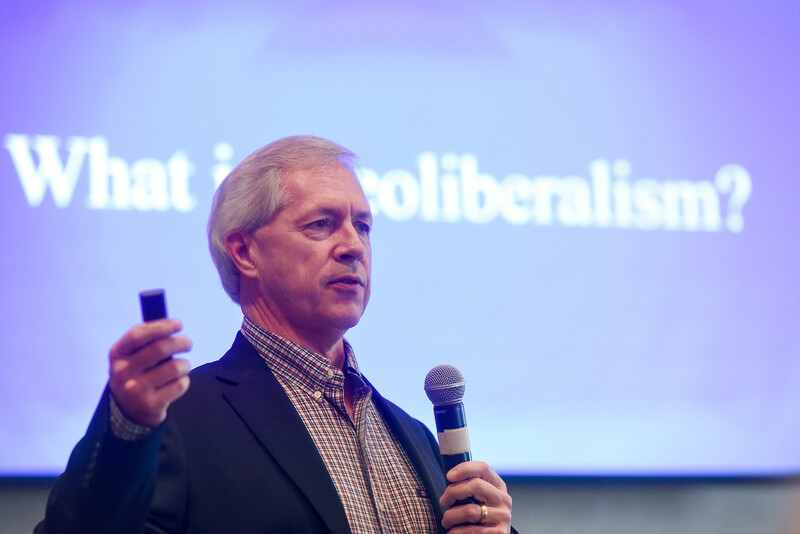 Rogers-Vaughn pointed to a number of changes in American society that occurred in the 1980s, particularly the rise of neoliberalism and its impact on culture the past 40 years. He noted how in 1983, 90 percent of media was owned by 50 companies while in 2018, 90 percent is held by a mere five companies, a figure that may decline even more as Disney’s purchase of 21st Century Fox is anticipated to be complete next year. In addition, Americans are experience more credit card debt percentage-wise that ever before in recorded history. Plus, significant gaps between the “haves and have nots” exist and are expanding. Dr. Rogers-Vaughn went on to discuss how the current phase of capitalism is negatively impacting clients’ social, interpersonal, and psychological health through a form of human distress, one he calls the “third order suffering.” In small groups attendees were able to examine how they see secularization and postmodernity impacting clients. The all day session also suggested solutions, providing details on how counselors can offer help and care to those needing assistance. Rogers-Vaughn is associate professor of the practice of pastoral theology and counseling at Vanderbilt Divinity School. He brings 30 years of experience in clinical pastoral psychotherapy to his teaching and research and is president/co-founder of the Pastoral Center for Healing in Nashville, where he continues his clinical practice.